Passover is a holiday that is rich with meaning and filled with traditions, many of which involve food. If you are managing food allergies, this list can help you find new ways to keep those traditions while keeping your child with food allergies safe and included. We understand that in Jewish law, avoiding risk to life is very important. If you have concerns about whether a tradition or food is safe for your child, talk with your allergist. Also, your rabbi may be able to help you find a safe way to adapt a tradition for your family. The Kids With Food Allergies Community Forums are a great place to connect with other parents who can share experiences. Wine/Grape Juice – Other liquids may be able to be substituted for the “four cups,” such as a juice, water or formula. Matzah – Certified gluten-free oat matzah is available from Lakewood Matzoh. There are also non-grain faux “matzahs", which may work for symbolic purposes only, such as Yehuda Gluten-Free Matzo (available from Amazon). Roasted/Hard Boiled Egg – Replace with a plastic egg containing seeds that are safe to eat or seeds that your family can plant together after the Seder. Just like the egg, the seeds will represent rebirth and the coming of spring. Bitter Herbs – Use romaine lettuce, other bitter greens or horseradish. Charoset – Use a nut-free recipe (such as Turkish Charoset from KFA’s Safe Eats™ recipe collection). For those able to eat only sugar, make a sugar and water syrup. For those who cannot eat at all, mix sand and water into a mortar-like paste to represent the Charoset. Karpas – Parsley, celery or potato are traditional options, or you can substitute with another vegetable. For those who can have only sugar, dip sugar candies into the salt water. 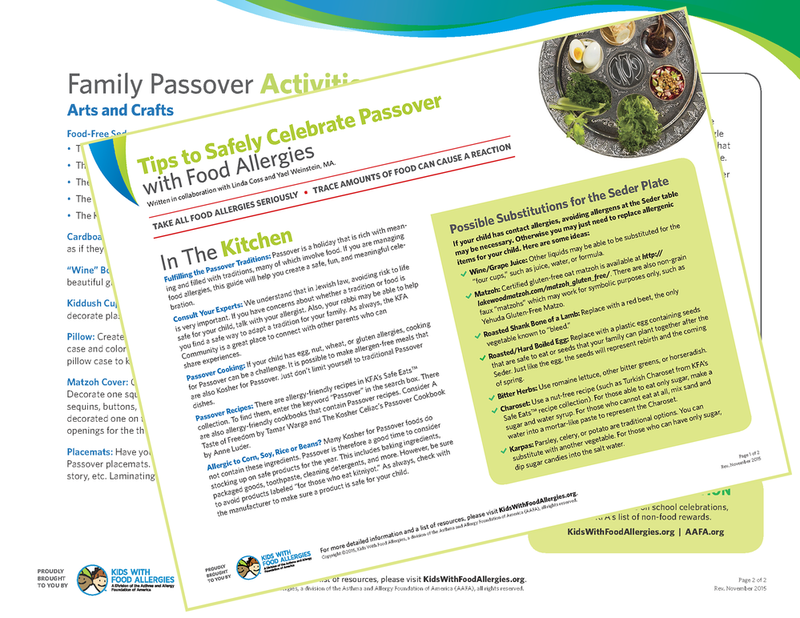 If your child has egg, nut, wheat or gluten allergies, cooking for Passover can be a challenge. It is possible to make allergen-free meals that are also Kosher for Passover. Just don’t limit yourself to traditional Passover dishes. 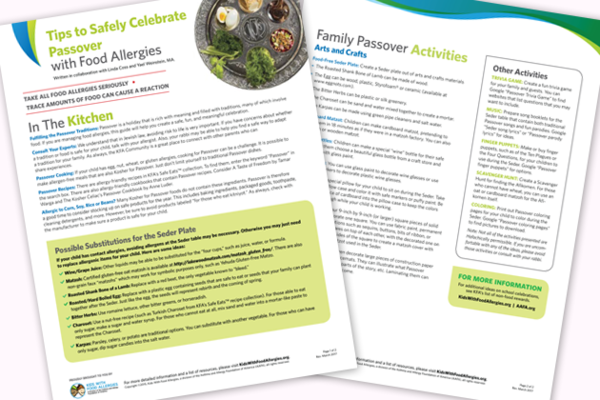 Passover Recipes: There are allergen-free recipes in KFA’s SafeEats™ recipe collection. To find them, enter the keyword “Passover” in the search box. There are also allergy-friendly cookbooks that contain Passover recipes. Consider A Taste of Freedom by Tamar Warga and The Kosher Celiac’s Passover Cookbook by Anne Luder. Allergic to Corn, Soy, Rice or Beans? Many Kosher for Passover foods do not contain these ingredients. Passover is therefore a good time to consider stocking up on safe products for the year. This includes baking ingredients, packaged goods, toothpaste, cleaning detergents and more. However, be sure to avoid products labeled “for those who eat kitniyot.” As always, check with the manufacturer to make sure a product is safe for your child. 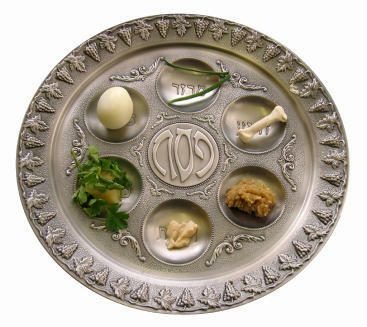 Food-Free Seder Plate – Create a Seder plate out of arts and crafts materials. The Roasted Shank Bone of Lamb can be made of wood. The Egg can be wood, plastic, Styrofoam® or ceramic (available at www.eggnots.com). The Bitter Herbs can be plastic or silk greenery. The Charoset can be sand and water mixed together to create a mortar. The Karpas can be made using green pipe cleaners and salt water. Cardboard Matzot – Children can make cardboard matzot, pretending to make them in 18 minutes as if they were in a matzah factory. You can also buy cloth or wooden matzot. “Wine” Bottles – Children can make a special “Wine” bottle for their safe drink. Have them choose a beautiful glass bottle from a craft store and decorate it with glass paint. Kiddush Cups – You can use glass paint to decorate glass wine cups, or use permanent markers to decorate plastic wine glasses. Pillow – Create a special pillow for your child to sit on during the Seder. Take plain colored pillow cases and color them with safe markers or puffy paint. Be sure to insert a piece of cardboard into the pillow case to keep the colors from bleeding through while your child is working. Matzah Cover – Cut four 9-inch by 9-inch (or larger) square pieces of solid color cloth or felt. Decorate one square. You can use fabric paint, permanent markers, and/or decorations such as sequins, buttons, bits of ribbon, or yarn. Layer the four squares on top of each other, with the decorated one on top. Stitch around three sides of the square to create a Matzah cover with openings for the three matzah used in the Seder. Placemats – Have your children decorate large pieces of construction paper to make special Passover placemats. They can illustrate what Passover means to them, their favorite parts of the story, etc. Laminating them can create a keepsake for years to come. Trivia Game – Create a fun trivia game for your family and guests. You can Google “Passover Trivia Game” to find websites that list questions that you may want to include. Music – Prepare song booklets for the Seder table that contain both traditional Passover songs and fun parodies. Google “Seder song lyrics” or “Passover parody lyrics” for ideas. Finger Puppets – Make or buy finger puppets, such as of the Ten Plagues or the Four Questions, for your children to use during the Seder. Google “Passover finger puppets” for options. Scavenger Hunt – Create a Scavenger Hunt for finding the Afikomen. For those who cannot have wheat, you can use an oat or cardboard matzah for the Afikomen itself. Coloring – Print out Passover coloring pages for your child to color during the Seder. Google “Passover coloring pages” to find pictures to download. Note: Not all of the activities presented are Halachically permissible. If you are uncomfortable with any of the ideas, please avoid those activities or consult with your Rabbi. another issue that kept me awake last week. During the "purge" week, people in the West Coast "should" purge ALL their emergency food .. which makes the family ultra vulnerable in care of an earthquake, until new food has been purchased. Let us know your thoughts Happy Passover! I'm Orthodox and although these ideas are great for some, I've dealt with allergies for Passover for 9 years. Yes, there are ways around everything, but some of these ideas are a bit unconventional. Please, please take these ideas with a grain of salt and speak to a rabbi. If anyone were to need ideas, you're more than welcome to contact me via private message.